I hit up my favorite local beauty supply for an Essie haul, but for whatever reason I only picked up a single polish! I really wanted Taj-Ma-Haul from the 2016 Resort collection, but as luck would have it, that was literally the only shade missing from their Resort display! There were loads of the other three colors, of course, but none of them spoke to me, so all I got was one color from Essie’s 2016 Bridal collection. Not being a huge soft neutrals kind of person, I usually don’t find the bridal shades too appealing. This one is a huge exception! Passport to Happiness (980—Essie are getting remarkably close to a 4-digit product code!) and the other bridal colors aren’t yet up on Essie’s website, so I don’t have their official shade description. I call it a pale mint pastel packed with fine, pearly shimmer that gives it the finish of a satin ribbon. If you can’t already tell, I’m in love with the color! But the formula is not equally love: it’s a bit streaky and I found that I needed three coats for even coverage. Ahh, the disappointment of pastels! If you really love mint shades, though, I’d still recommend that you run and and get this ASAP. 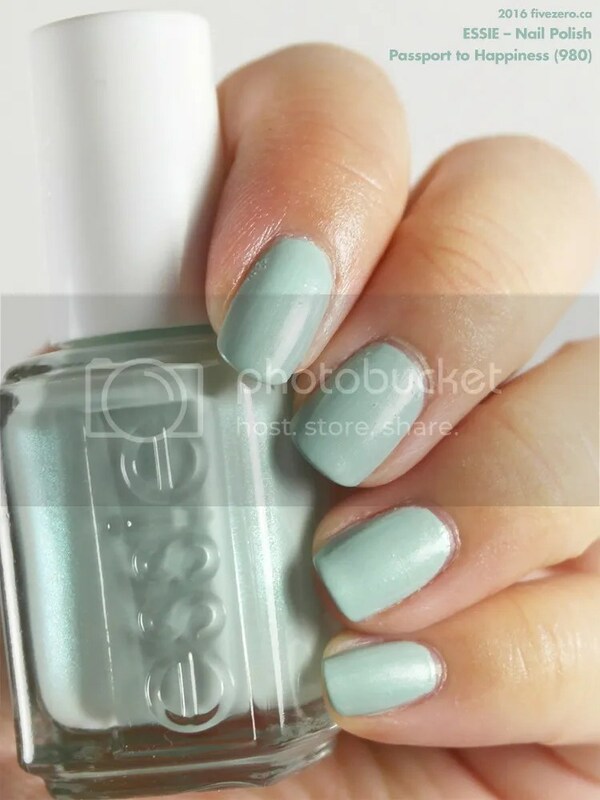 Essie Nail Polish retails for US$8.50 / CA$9.99–$10.99 and is 0.46 US fl oz / 13.5 mL. The polish is free of toluene, formaldehyde, and dibutyl phthalate (DBP). It is made in the USA. Gorgeous shade for this Spring. Have an awesome start of the week.